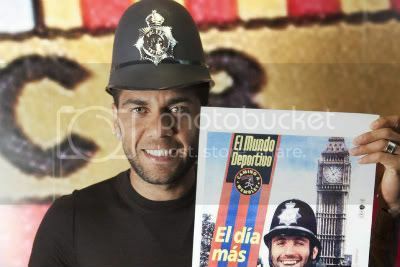 In an exclusive interview, Dani Alves talks to Fernando Duarte about his move to Barcelona, the prospect of a first Champions League final – and his contempt for those cheat allegations. I thought this was very interesting, especially the comments in regards to Busquets and the Pepe situation. I wish there were more interviews with him! FC Barcelona is pleased to announce an agreement with Dani Alves to extend his contract with the club for another three seasons, until June 30, 2015. The document will be signed on Wednesday at around 19.00. There will then be a photograph session open to the media by the doors to the FC Barcelona offices. Daniel Alves, footballer of FC Barcelona and the Brazilian NT, has stated that “unfortunately” he has already “learned to live with” racism in Spain, and that the situation is “beyond control” in Spanish stadiums. I dunno what you guys think, but he deserves a HUGE PICSPAM. Barcelinha over and out, have a ball Culitas, and Visca Barca!